More reviews on Sab The Book Eater!I was pretty iffy about this book at first because it sounded a lot like The Princess Diaries and The Prince & Me but a few chapters into the book I found myself insanely engrossed that I forgot all about my doubts. Simply put, this book was amazing. It was cute and really engaging!The thing that really captured my interest was Sam herself. She's really an interesting, well-rounded character and she was written so well that I felt that she was real. It wasn't hard to like her. Her experiences made her strong and she's definitely one tough cookie. I like that despite Alex's past and the many women he was linked to, Sam didn't let her jealousy get in the way. She didn't even say how jealous she was. She just thought about it and let it go - and that just shows how confident she is.I especially loved the romance between her and Alex a.k.a Prince Yummy. This is probably the thing that kept me reading so fast! He was just. So. Swoon worthy!!! I loved the banters between Sam and Alex and I loved how it wasn't insta love. Sure, the initial physical attraction was there but Alex waited till Sam was completely ready to give in (and boy did she). And when Sam did give in, it was hot and sweet all at the same time. I couldn't get enough of them, they were so good together!The secondary characters were also very enjoyable. They weren't just characters delivering lines, they really added to the story! I enjoyed Sam and Jess' friendship, Sam's dynamics with Chadwick and her relationship with her father. It was refreshing to read something that didn't simply focus on the main character and her love interest. All of the characters in the book felt alive.Lastly, I liked that this is a New Adult novel mainly because I belong to that age group. Ha! Seriously though, I liked seeing the story through Sam's eyes who had tons of responsibilities at home (graduate studies, her dad) but chose to live in Lilaria and take up more responsibilties. It isn't just light and fluffy because Sam's older (20-ish) than the usual female protagonists in a princess story. 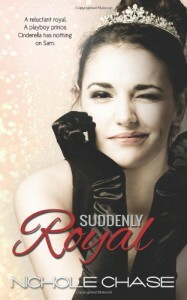 I felt that there was more depth to it.If you're looking for a fun and insanely swoon worthy read, go for Suddenly Royal. You'll be grinning like crazy from start to finish (like me. Heh!). ;-)I received an Advance Reading Copy of this book for reviewThis review is based solely on my opinion.